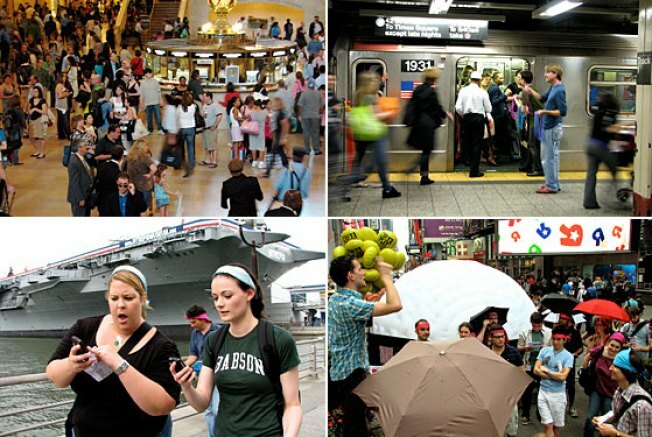 States of play, clockwise from top right: Mardi Gras beads for subway strangers; participants learn rules for their next game; two players ponder text-message clues; secret-agent games in Grand Central. It was kind of a strange weekend around town: Commuters hopping on the 42nd Street S (shuttle) train Friday evening were confronted by people holding strands of beads and asked to don one until the next platform. Meanwhile, in Grand Central, a dozen or so strangers were casing the main hall, receiving phoned instructions from “secret agents” in order to orchestrate the delivery of a package to Campbell Apartment. And around Times Square, iPhone-wielding individuals were swinging their phones like golf clubs, then gamely running off to chase down their “ball” on whatever block it may have landed. This wasn’t a collective dive into insanity, exactly. These were just some moments from Come Out and Play, a festival celebrating so-called “Big Games” in urban environments. The festival's co-founder, Greg Trefry, explained the appeal. "For us, it's clear people don't just want to play in front of a computer," he said. And so Big Games take elements of childhood play — like, say, a scavenger hunt or board game — and plop them down in an urban environment. Gather a bunch of willing participants, give them some 34 different games to play, and you've got a memorable weekend. Caroline Himmelman, a 26-year-old Astoria resident, posed as one of the aforementioned secret agents in Grand Central for a fairly elaborate and complex game called Stalk Exchange. Unfortunately, the fun got cut short due to security concerns — a bunch of people suspiciously lurking around the main hall on Friday night was likely to prompt that kind of response. But by Saturday afternoon, Himmelman found herself sporting a red wig and walking around Fifth Avenue with a two-man “entourage” for another game called Paparazzi. The goal was to make it to impromptu “party spots” without being photographed by rival teams. “It’s so crazy ducking around scared in the middle of Manhattan,” Himmelman said. Secretaries of the Treasury: They’re Just Like Us!